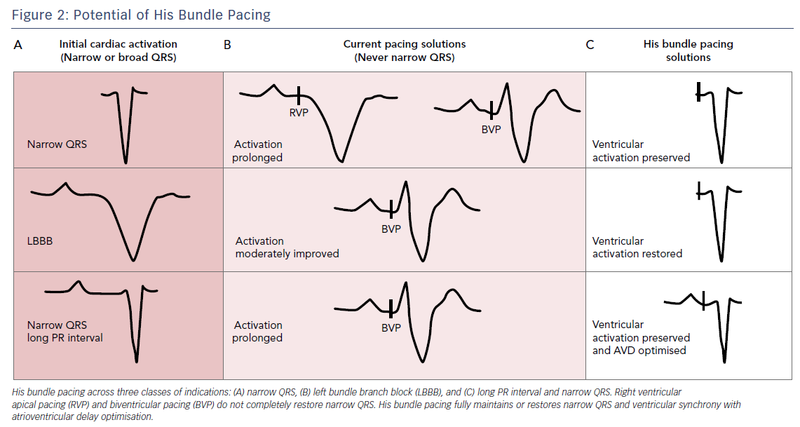 Biventricular pacing has revolutionised the treatment of heart failure in patients with sinus rhythm and left bundle branch block; however, left ventricular-lead placement is not always technically possible. Furthermore, biventricular pacing does not fully normalise ventricular activation and, therefore, the ventricular resynchronisation is imperfect. Right ventricular pacing for bradycardia may cause or worsen heart failure in some patients by causing dyssynchronous ventricular activation. His bundle pacing activates the ventricles via the native His-Purkinje system, resulting in true physiological pacing, and, therefore, is a promising alternate site for pacing in bradycardia and traditional CRT indications in cases where it can overcome left bundle branch block. Furthermore, it may open up new indications for pacing therapy in heart failure, such as targeting patients with PR prolongation, but a narrow QRS duration. In this article we explore the physiology, technology and potential roles of His bundle pacing in the prevention and treatment of heart failure. Arrhythmia & Electrophysiology Review 2018;7(2):103–10. His bundle pacing in humans was first described in 1970 by Narula et al.1 They demonstrated that it was possible to stimulate the His bundle to produce normal physiological ventricular activation via the His-Purkinje system. However, the first report of permanent His bundle pacing, by Deshmukh et al., did not occur until 2000.2 In that study, His pacing was performed in a series of patients with impaired left ventricular systolic function and AF prior to atrioventricular (AV) node ablation. 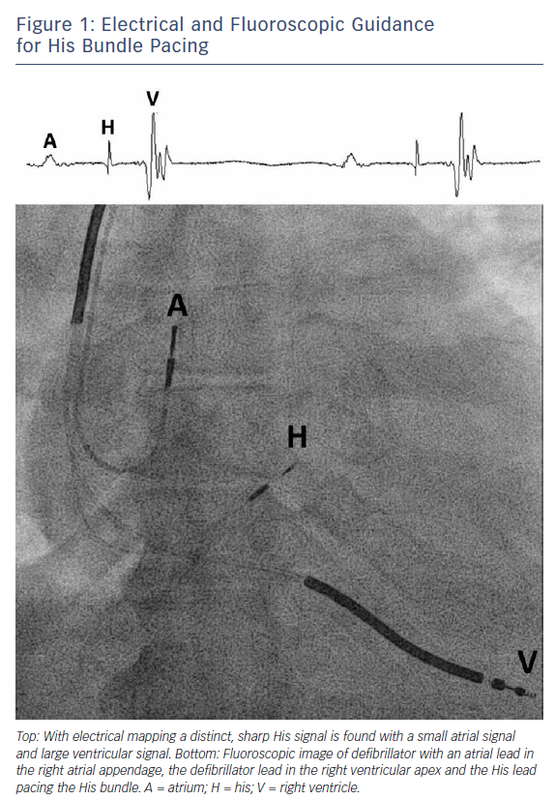 The lack of dedicated tools for implantation initially hampered enthusiasm; however, the development of specially designed sheaths and leads for delivering permanent His bundle pacing has led to a renewed interest. The potential role of His pacing in heart failure is large: it may prevent the development of pacing-induced cardiomyopathy; it may be used as an alternative to biventricular pacing in patients with heart failure and left bundle branch block (LBBB); and it may extend pacing therapy in heart failure to patients with narrow QRS and PR prolongation by providing AV synchrony without inducing ventricular dyssynchrony. The bundle of His extends from the compact AV node to the membranous interventricular septum, and measures approximately 20 mm in length. The bundle is a cord-like structure made up of multiple strands, which, even before the branching, are predestined to become the right or left bundle branches. His bundle pacing can be achieved by placing the lead at the atrial portion against the septum. The most commonly used lead for His bundle pacing is the 69 cm Select Secure™ 3830 (Medtronic). This is a non-stylet-driven active fixation lead. Importantly, the screw forms part of the tip electrode allowing penetration of the capsule of the bundle of His and, therefore, direct stimulation of the His bundle fibres. The lead can be delivered to the His bundle region using either the specially-designed non-deflectable His delivery sheath (C315 43 cm; Medtronic) or a deflectable sheath (C304 69 cm; Medtronic). Unlike traditional lead placement that primarily uses fluoroscopic guidance, His lead placement primarily uses electrical mapping. An electrogram from the lead tip is displayed using placement via either a lab electrophysiology system or a standard pacing system analyser. His bundle capture may be either selective or non-selective. With selective capture, only the His bundle fibres are stimulated and, therefore, activation occurs entirely via the His-Purkinje system. With non-selective capture both the His bundle fibres and local myocardium are captured. During non-selective capture a pseudo delta wave on the surface ECG is formed from local myocardial capture. His pacing has the potential to provide better pacing solutions in several clinical situations compared with existing techniques. It may be useful in preventing pacing-induced cardiomyopathy, and pacing therapy may be an option for patients with existing heart failure in a range of settings (Figure 2). Biventricular pacing has been investigated as a way for mitigating the detrimental effects of ventricular pacing in patients who require high percentages of right ventricular pacing. In the Biventricular Versus Right Ventricular Pacing in Heart Failure Patients With Atrioventricular Block (BLOCK HF) study, biventricular pacing was associated with a lower incidence of death or urgent care visits for heart failure and significantly improved left ventricular end-diastolic volumes compared with right ventricular pacing.14 This study included patients with heart failure, left ventricular ejection fraction <50 % and evidence of AV block. His pacing offers an elegant solution to potentially avoid pacing-induced deterioration in cardiac function. Since activation occurs via the normal conduction system, it does not result in ventricular dyssynchrony.18 Compared with right ventricular pacing, His pacing results in improved LVF both acutely19 and with chronic pacing.20 Pacing-avoidance algorithms may be unnecessary, which has the advantage of allowing physiological AV delays to be programmed. 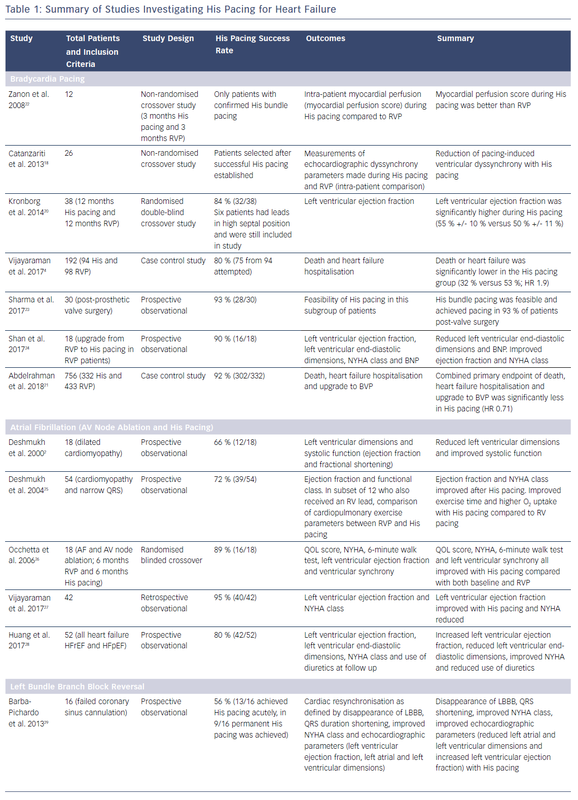 There have been no large randomised controlled-outcome studies comparing His pacing with right ventricular pacing; however, the available data are encouraging (Table 1). Data from observational studies show chronic His pacing, in patients with a bradycardia pacing indication, appears to be feasible and safe.4 His pacing success rates have improved with the development of dedicated tools, and, in this population, successful His lead implantation occurs in 90 % of patients. A recent non-randomised case control study found that patients who received His pacing for a bradycardia indication had a lower incidence of death and hospitalisation for heart failure compared with a group of patients treated with right ventricular pacing.21 A randomised controlled trial is now required to establish whether these encouraging results translate into clinical benefits in adequately-powered randomised control trials. His bundle pacing may deliver substantial benefits in patients with heart failure after AV node ablation for AF. In patients with AF and LBBB, the evidence for biventricular pacing is minimal, often limited to subgroup data from randomised controlled trials.33 Observational data have suggested some benefit of AV node ablation and left ventricular lead implantation in this group to ensure 100 % biventricular pacing.34,35 Permanent His bundle pacing may yet allow a more elegant solution if His bundle pacing allows reversal of LBBB. Theoretically, His pacing is a better method for delivering pacing since the lead can be positioned distal to the ablation site, and can maintain normal conduction via the His-Purkinje system. 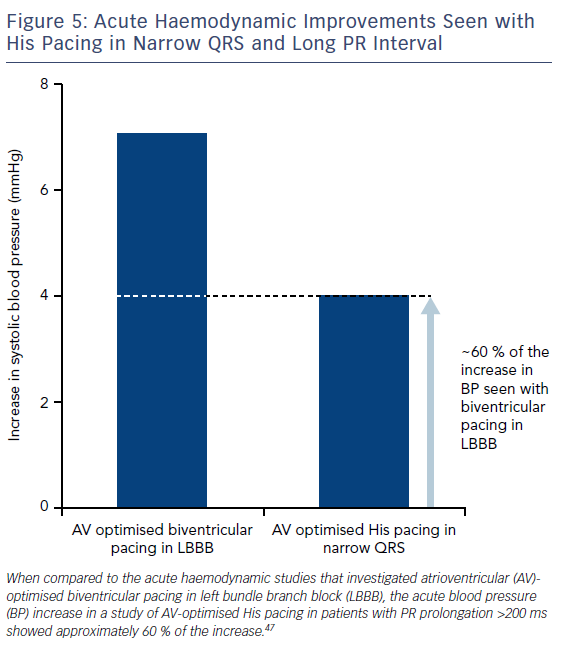 This is also an option in patients with a narrow QRS where inadequate rate-controlled AF contributes to poor LVF. Heart failure patients were the first group in which permanent His pacing was applied. Despite lacking dedicated tools for His pacing, Deshmukh et al. achieved successful His pacing in 60 % of patients and were able to successfully perform AV node ablation with the His lead in situ.2 Improvements in left ventricular systolic function and left ventricular dimensions were observed. Observational studies performed with dedicated tools for His pacing have found a higher rate of implant success (Table 1). A recent study successfully achieved permanent His pacing in 80 % of patients with both heart failure with a preserved ejection fraction and heart failure with reduced ejection fraction. These patients had AF and a narrow QRS, and despite rate-controlled AF they observed a reduction in hospital admissions, diuretic use, symptoms and improved cardiac function.28 However, despite the benefits seen in observational data, no randomised controlled studies are available. His bundle pacing is an alternative technique for delivering cardiac resynchronisation therapy. It can dramatically shorten QRS duration (Figure 3) and restore normal intrinsic activation patterns in some patients with ventricular conduction delays. Source-sink relationships: overcoming the block with sufficient stimulus to activate distal dormant tissue relying on either source-sink relationships during pacing versus intrinsic impulse propagation or the virtual electrode polarisation effects. Retrograde activation: retrograde activation of the His-Purkinje system via capture of an upper septal branch allowing onward antegrade activation beyond a site of block. His pacing has been shown to be feasible in this population of patients. 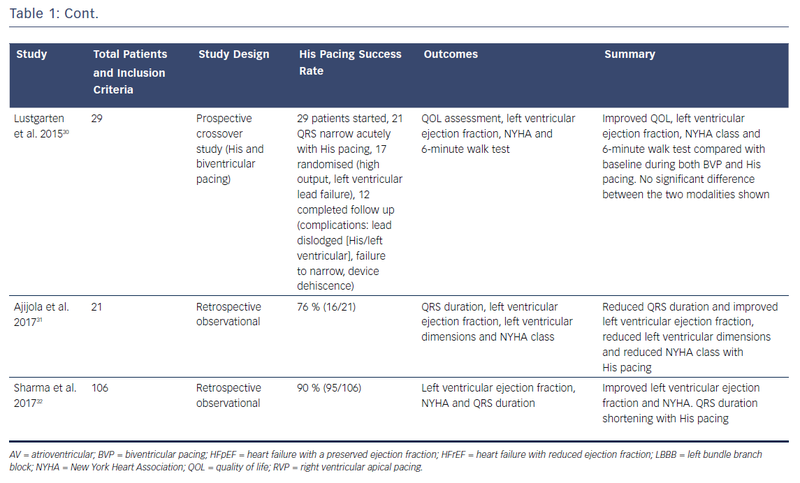 Reductions in QRS duration have been observed in 70–92 % of patients with LBBB (Table 1). The reductions in QRS duration appear to be maintained even with chronic pacing, and mean thresholds are similar to those seen for left ventricular leads; for example, in one study thresholds to achieve this are 2.0 V at 1 ms (mean threshold 1.4 V at 1 ms). There has been no demonstrated correlation with QRS morphology and axis, and QRS normalisation patterns (i.e. even broad LBBB with left axis deviation where the lead is unlikely to be screwed in distally to the block). His pacing was initially assessed as a rescue strategy in cases where biventricular pacing failed,29,32 and some authors have shown that His pacing is feasible as a primary strategy for cardiac resynchronisation.30 In a crossover study, His pacing was more effective than biventricular pacing at reducing QRS duration in 72 % of patients (21/29). Two patients achieved QRS narrowing with His pacing but with high outputs, and six patients did not show any QRS narrowing with His pacing despite multiple sites tried. With improved technology and experience, permanent His pacing achieved QRS narrowing in 90 % of patients.32 The reasons for failure in achieving QRS narrowing is not fully understood. It is possible this subgroup of patients have abnormal left ventricular conduction due to disease outside of the His bundle and, therefore, cannot be treated with His pacing, or the block is too severe to overcome. The proportion of patients with conduction delays caused by disease distal to the His bundle is not known. His pacing has the advantage that it does not require the use of contrast and can often be performed more quickly than left ventricular lead placement. However, adequately powered randomised studies are required to compare this strategy for resynchronisation therapy with biventricular pacing. In 2016 recruitment started for the His Bundle Pacing Versus Coronary Sinus Pacing for Cardiac Resynchronisation Therapy (His-SYNC; NCT02700425) study, which is aiming to randomise 40 patients to either His pacing or biventricular pacing and will look at time to first cardiovascular hospitalisation or death. His pacing has the advantage that it may allow AV delay to be optimised while normal intrinsic ventricular activation is maintained. We have previously demonstrated that acute haemodynamic function is improved with AV-optimised His bundle pacing in patients with heart failure and PR prolongation with either a normal QRS or RBBB.47 The magnitude of acute haemodynamic corresponded to approximately 60 % of the benefit seen in patients with LBBB receiving biventricular pacing (Figure 5). The His Optimised Pacing Evaluated for Heart Failure Trial (HOPE-HF; NCT02671903) trial is a multicentre, double-blind, randomised, crossover study that aims to randomise 160 patients with PR prolongation (≥200 ms), left ventricular impairment (ejection fraction ≤40 %), and either narrow QRS (≤140 ms) or RBBB. Participants are first randomised to either 6 months with the His lead programmed on or off before crossing over to the alternate arm. The primary endpoint is exercise capacity measured using cardiopulmonary exercise testing. When randomised to the His pacing arm, the patients are set to an AV delay determined by our high resolution haemodynamic optimisation protocol.45 If the results are positive then this would offer the potential of a new therapeutic option to a cohort of patients with heart failure who are not currently eligible for pacing therapy for heart failure. There is currently limited published data available for His pacing in any clinical setting. While pacing thresholds for His pacing in bradycardia appear to be stable, there is limited long-term follow-up data available. When His pacing is used to deliver ventricular resynchronisation in patients with bundle branch block, the pacing thresholds can be relatively high, though comparable to left ventricular pacing thresholds. This has the potential implications on battery longevity, though pacing is only required via a single lead (compared to biventricular pacing). Success rates for His lead implantation have been as low as 60 % without dedicated tools and experience. Success rates have improved with the development of dedicated tools; however, the range of tools currently available are still limited, and these could be further improved. Adequately powered randomised control trials are required to investigate whether the theoretical advantages of physiological ventricular activation are achieved with His pacing and if the encouraging results in observational studies translate into clinical benefit. Finally, current device-based algorithms do not dovetail with His bundle pacing and this pacing sphere could benefit from industry investment in His pacing customised algorithms. His pacing is a novel pacing therapy that allows ventricular stimulation to occur via the normal conduction system. Therefore, it maintains normal ventricular activation in patients with a narrow QRS duration and may even reverse bundle branch block. Technical limitations have restricted the use of this therapy despite its existence for over four decades. In recent years tools dedicated to His pacing have been developed, which have improved the ease with which His pacing can be delivered. His pacing is now technically feasible in most patients and has shown promising results in small, mainly non-randomised studies in various clinical situations. His pacing may be beneficial in the prevention of pacing-induced cardiomyopathy, as an alternative to biventricular pacing in patients with heart failure and LBBB, and as a method for extending pacing therapy for heart failure to patients with narrow QRS and PR prolongation. Large randomised studies are now required to provide confirmation these promising results translate into proven clinical benefits. His-bundle pacing is a feasible method for delivering permanent pacing. It produces physiological ventricular activation via the His-Purkinje system. His pacing offers an alternative bradycardia pacing modality to right ventricular pacing and has the advantage that it does not cause intraventricular dyssynchrony. His pacing can achieve cardiac resynchronisation in patients with heart failure and bundle branch block. Data regarding safety, chronic sensing and pacing thresholds are encouraging, but data from larger registries is awaited. Randomised controlled trial data to assess the benefits of His bundle pacing for bradycardia and heart failure indications are not yet available. Narula OS, Scherlag BJ, Samet P. Pervenous pacing of the specialized conducting system in man: His bundle and A-V nodal stimulation. Circulation 1970;41:77–87. Deshmukh P, Casavant DA, Romanyshyn M, Anderson K. Permanent, direct His-bundle pacing: a novel approach to cardiac pacing in patients with normal His-Purkinje activation. Circulation 2000;101:869–77. Vijayaraman P, Dandamudi G, Zanon F, et al. Permanent His bundle pacing: recommendations from a multi-center HBP collaborative working group for standardization of definitions, implant measurements, and follow-up. Heart Rhythm 2018;15:460–8. Vijayaraman P, Naperkowski A, Subzposh FA, et al. Permanent His bundle pacing: long-term lead performance and clinical outcomes. Heart Rhythm 2017;epub ahead of press. Wilkoff BL, Cook JR, Epstein AE, et al. Dual-chamber pacing or ventricular backup pacing in patients with an implantable defibrillator: the dual chamber and VVI implantable defibrillator (DAVID) trial. JAMA 2002;288:3115–23. Sweeney MO, Hellkamp AS, Ellenbogen KA, et al. Adverse effect of ventricular pacing on heart failure and atrial fibrillation among patients with normal baseline QRS duration in a clinical trial of pacemaker therapy for sinus node dysfunction. Circulation 2003;107:2932–37. Thambo JB, Bordachar P, Garrigue S, et al. Detrimental ventricular remodeling in patients with congenital complete heart block and chronic right ventricular apical pacing. Circulation 2004;110:3766–72. O’Keefe JH Jr, Abuissa H, Jones PG, et al. Effect of chronic right ventricular apical pacing on left ventricular function. Am J Cardiol 2005;95:771–3. Thackray SD, Witte KK, Nikitin NP, et al. The prevalence of heart failure and asymptomatic left ventricular systolic dysfunction in a typical regional pacemaker population. Eur Heart J 2003;24:1143–52. Frias PA, Corvera JS, Schmarkey L, et al. Evaluation of myocardial performance with conventional single-site ventricular pacing and biventricular pacing in a canine model of atrioventricular block. J Cardiovasc Electrophysiol 2003;14:996–1000. Gillis AM, Pürerfellner H, Israel CW, et al. Reducing unnecessary right ventricular pacing with the managed ventricular pacing mode in patients with sinus node disease and AV block. Pacing Clin Electrophysiol 2006;29:697–705. Milasinovic G, Tscheliessnigg K, Boehmer A, et al. Percent ventricular pacing with managed ventricular pacing mode in standard pacemaker population. Europace 2008;10:151–5. Yadav R, Jaswal A, Chennapragada S, et al. Effectiveness of ventricular intrinsic preference (VIP) and ventricular autocapture (VAC) algorithms in pacemaker patients: results of the validate study. J Arrhythm 2016;32:29–35. Curtis AB, Worley SJ, Adamson PB, et al. Biventricular pacing for atrioventricular block and systolic dysfunction. N Engl J Med 2013;368:1585–93. Yu CM, Chan JY, Zhang Q, et al. Biventricular pacing in patients with bradycardia and normal ejection fraction. N Engl J Med 2009;361:2123–34. Ploux, S, Eschalier R, Whinnett ZI, et al. Electrical dyssynchrony induced by biventricular pacing: implications for patient selection and therapy improvement. Heart Rhythm 2015;12:782–91. Dreger H, Maethner K, Bondke H, et al. Pacing-induced cardiomyopathy in patients with right ventricular stimulation for >15 years. Europace 2012;14:238–42. Catanzariti D, Maines M, Manica A, et al. Permanent His-bundle pacing maintains long-term ventricular synchrony and left ventricular performance, unlike conventional right ventricular apical pacing. Europace 2013;15:546–53. Kronborg MB, Poulsen SH, Mortensen PT, Nielsen JC. Left ventricular performance during para-His pacing in patients with high-grade atrioventricular block: an acute study. Europace 2012;14:841–46. Kronborg MB, Mortensen PT, Poulsen SH, et al. His or para-His pacing preserves left ventricular function in atrioventricular block: a double-blind, randomized, crossover study. Europace 2014;16:1189–96. Abdelrahman M, Subzposh FA, Beer D, et al. Clinical outcomes of His bundle pacing compared to right ventricular pacing. J Am Coll Cardiol 2018;epub ahead of press. Zanon F, Bacchiega E, Rampin L, et al. Direct His bundle pacing preserves coronary perfusion compared with right ventricular apical pacing: a prospective, cross-over mid-term study. Europace 2008;10:580–7. Sharma PS, Subzposh FA, Ellenbogen KA, Vijayaraman P. Permanent His-bundle pacing in patients with prosthetic cardiac valves. Heart Rhythm 2017;14:59–64. Shan P, Su L, Zhou X, et al. Beneficial effects of upgrading to His bundle pacing in chronically paced patients with left ventricular ejection fraction <50%. Heart Rhythm 2018;15:405–12. Deshmukh PM, Romanyshyn M. Direct His-Bundle Pacing: present and future. Pacing Clin Electrophysiol 2004;27:862–70. Occhetta E, Bortnik M, Magnani A, et al. Prevention of ventricular desynchronization by permanent para-Hisian pacing after atrioventricular node ablation in chronic atrial fibrillation: a crossover, blinded, randomized study versus apical right ventricular pacing. J Am Coll Cardiol 2006;47:1938–45. Vijayaraman P, Subzposh FA, Naperkowski A. Atrioventricular node ablation and His bundle pacing. Europace 2017;19:iv10–6. Huang W, Su L, Wu S, et al. Benefits of permanent His bundle pacing combined with atrioventricular node ablation in atrial fibrillation patients with heart failure with both preserved and reduced left ventricular ejection fraction. J Am Heart Assoc 2017;6:e005309. Barba-Pichardo R, Manovel Sánchez A, Fernández-Gómez JM, et al. Ventricular resynchronization therapy by direct His-bundle pacing using an internal cardioverter defibrillator. Europace 2013;15:83–8. Lustgarten DL, Crespo EM, Arkhipova-Jenkins I, et al. His-bundle pacing versus biventricular pacing in cardiac resynchronization therapy patients: a crossover design comparison. Heart Rhythm 2015;12:1548–57. Ajijola OA, Romero J, Vorobiof G, et al. Hyper-response to cardiac resynchronization with permanent His bundle pacing: is parahisian pacing sufficient? HeartRhythm Case Rep 2015;1:429–33. Sharma PS, Dandamudi G, Herweg B, et al. Permanent His-bundle pacing as an alternative to biventricular pacing for cardiac resynchronization therapy: a multicenter experience. Heart Rhythm 2018;15:413–20. Tang AS, Wells GA, Talajic M, et al. Cardiac-resynchronization therapy for mild-to-moderate heart failure. N Engl J Med 2010;363:2385–95. Gasparini M, Regoli F, Galimberti P, et al. Cardiac resynchronization therapy in heart failure patients with atrial fibrillation. Europace 2009;11:v82–6. Gasparini M, Auricchio A, Regoli F, et al. Four-year efficacy of cardiac resynchronization therapy on exercise tolerance and disease progression: the importance of performing atrioventricular junction ablation in patients with atrial fibrillation. J Am Coll Cardiol 2006;48:734–43. Ruschitzka F, Abraham WT, Singh JP, et al. Cardiac-resynchronization therapy in heart failure with a narrow QRS complex. N Engl J Med 2013;369:1395–405. Jones S, Lumens J, Sohaib SM, et al. Cardiac resynchronization therapy: mechanisms of action and scope for further improvement in cardiac function. Europace 2017;19:1178–86. Narula OS. Longitudinal dissociation in the His bundle. 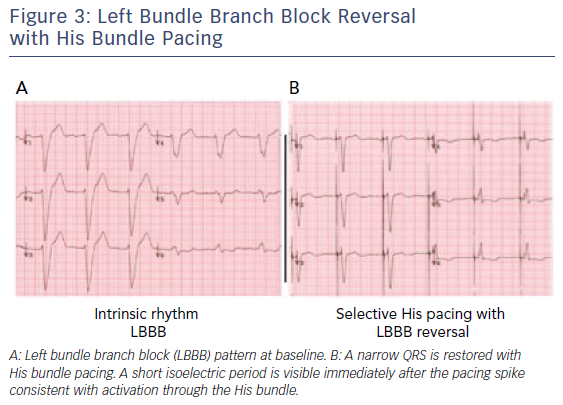 Bundle branch block due to asynchronous conduction within the His bundle in man. Circulation 1977;56:996–1006. El-Sherif N, Amay-Y-Leon F, Schonfield C, et al. Normalization of bundle branch block patterns by distal His bundle pacing. 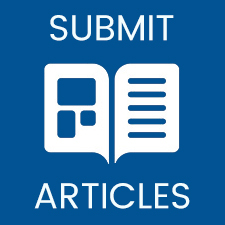 Clinical and experimental evidence of longitudinal dissociation in the pathologic His bundle. Circulation 1978;57:473–83. Abraham WT, Fisher WG, Smith AL, et al. Cardiac resynchronization in chronic heart failure. N Engl J Med 2002;346:1845–53. Wu G, Cai Y, Huang W, Su L. Hisian pacing restores cardiac function. J Electrocardiol 2013;46:676–8. Dabrowski P, Kleinrok A, Kozluk E, Opolski G. Physiologic resynchronization therapy: a case of His bundle pacing reversing physiologic conduction in a patient with CHF and LBBB during 2 years of observation. J Cardiovasc Electrophysiol 2011;22:813–7. Bristow MR, Saxon LA, Boehmer J, et al. Cardiac-resynchronization therapy with or without an implantable defibrillator in advanced chronic heart failure. N Engl J Med 2004;350:2140–50. Whinnett ZI, Davies JE, Willson K, et al. Haemodynamic effects of changes in atrioventricular and interventricular delay in cardiac resynchronisation therapy show a consistent pattern: analysis of shape, magnitude and relative importance of atrioventricular and interventricular delay. Heart 2006;92:1628–34. Sohaib SM, Chen Z, Whinnett ZI, et al. Meta-analysis of symptomatic response attributable to the pacing component of cardiac resynchronization therapy. Euro J Heart Fail 2013;15:1419–28. Sohaib SM, Wright I, Lim E, et al. Atrioventricular optimized direct His bundle pacing improves acute hemodynamic function in patients with heart failure and PR interval prolongation without left bundle branch block. JACC Clin Electrophysiol 2015;1:582–91.